I’ve been using a Wacom tablet for over 15 years, starting with their ADB-based ArtZ tablets. There have been other tablet entries into the market over the years, but none have stuck, and Wacom rules the roost. And for good reason - each iteration of the line offers more sensitivity, tilt, and options. 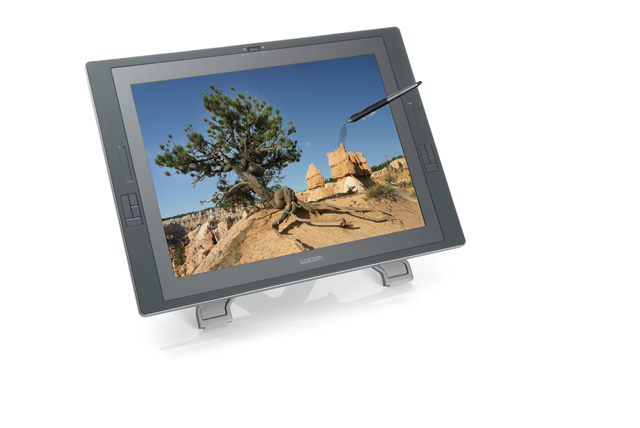 But the ultimate tablet is their Cintiq 21UX tablet, which bonds a tablet to a high-quality LCD display. The Cintiq 21UX can be used as a tablet, as a display, or as that tool that creates amazing synergy so that you retouch directly on your image, animate directly on the screen, or just sit back and view a high-end display with a plethora of other features. Wacom has had a tablet bonded to a display for some time, and in the beginning the quality of the display limited the colors displayed, which meant it was primarily for graphics, animation, and layout work. However that was then and the 21-inch Cintiq 21UX is now, and in this case, “now” means the tablet is bonded to one of the highest quality display components made, and the color depth is identical to a non-tablet display. This means that it can be calibrated, and also used for color critical work. Under the terms of my NDA (Non-Disclosure Agreement) I’m not allowed to say exactly who makes the display component, but I can assure you it’s not a generic model, but one of the highest-quality LCD components on the market. In fact, that is a significant reason for the cost of the 21-inch Cintiq. Once you work with it, however it’s worth every penny, with extremely even backlighting, a wide-angle of view, and a solid, almost handcrafted feel. Setting up the Cintiq is just like setting up any other monitor, with a few twists. The DVI cable is a cinch - just plug into your video card, and the USB cable provides tablet functionality. The next step is to set up the stand, which is unlike any stand you have ever used. Why? Well, most displays are meant to be viewed only in a vertical mode, whereas the Cintiq is meant be used on an angle or even in a horizontal position. You can even use it on your lap! The key is finding an angle and work surface that lets you comfortably draw and work on the tablet surface. I found that a slightly higher chair made a difference as well. My first challenge is that the surface where I normally work has a slew of hard drives, hubs, power supplies, and other cables, gadgets, all stashed in back of my display. This simply wouldn’t work with the Cintiq since that area was needed for the display to lie flat. The mount can adjust from almost vertical to flat, on a set of four rolling wheels, and has two metal paddles on the back for quick and precise adjustments. The CD contains an optimized ICC profile for the display. I found that using the monitor with the provided profile was virtually identical to the profile I created when self-profiling. This isn’t that surprising since the LCD component is new and should show little drift when new, and the supplied profile was meticulously created using state-of-the-art color spectrometers. If anything, it speaks to the standard of quality control. The Cintiq 21UX ships with a standard Wacom Grip Pen with an eraser tip on the top end, and a set of replacement stylus inserts. The pen can nest in a holder in the back of the display, on in the supplied aluminum block that sits on your table. For anyone used to working with a Wacom tablet, all this will be old hat. Its ability to let you work directly on the image is transformational. It did take a few days for me to get used to it, but once I really started to use the tools, I realized how productive the Cintiq allowed me to be. Even though with a normal tablet the vast majority of tools are tablet-aware, the ability to work onscreen is a constant reminder of just how powerful a tool they can become. On the sides of the display are eight programmable ExpressKeys that provide quick access to modifier keys, keyboard shortcuts, and pop-up menus. My favorites were two finger-sensitive Touch Strips that allow you to slide to zoom, scroll, or other actions. You can also rotate the display 180 degrees to use as a portrait display. I was able to put the Cintiq 21UX to the test while preparing for an exhibition of my photographic work. The final prints were quite large, and because of the size they revealed every detail of the original scans, which wasn’t always a good thing. I had to literally examine the files at a pixel level, and clean up artifacts, Newton Rings, dust, and other problems, and the Cintiq 21UX turned this from a chore into a reworking of the possibilities of each image. It’s a bit pricey, but when you figure in the cost of a full-sized Wacom Intuos tablet coupled with a wide-gamut display, the price isn’t that high by comparison. Besides, being able to work directly on your images with a Cintiq 21UX is priceless.